Eden Troyer, 14, of Elida Schools, hopes to become a nurse one day. 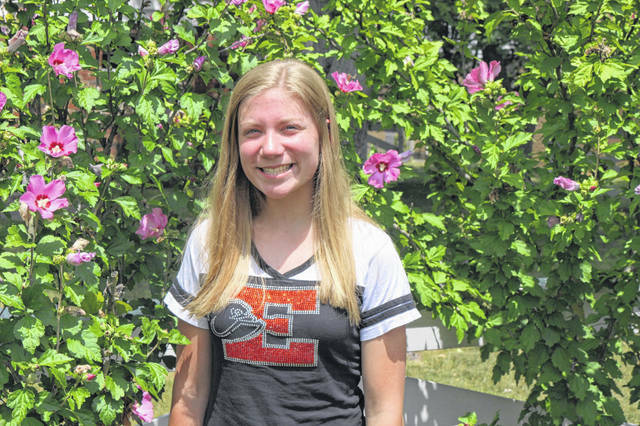 ELIDA — Eden Troyer, 14, an incoming freshman at Elida High School, recently spent a week at Nursing Camp at Indiana Wesleyan University. While high school graduation is still four years off, the experience is motivating her to pursue a nursing career. “You learned a lot of different things about trans-cultural missions, how you can do that in different countries where they don’t have many doctors around,” she said. Troyer’s experience gave her a good understanding of what the nursing field is all about. “We learned how to take blood pressure, pulse, how to bandage a wound and get patients in and out of bed and into a wheelchair. How to assess patients in pain and talk to them and how to change their sheets when they can’t get out of bed. We saw a birth and how it works and then I actually got to deliver a baby, not a real baby but a simulation. I love helping people and I love babies. I kind of want to go into the baby area, maybe labor and delivery,” she said. She also got certified in CPR during the Nursing Camp and visited with firefighters and EMT’s about how to handle a trauma case. She also learned how to administer Narcan to someone having a drug overdose. “I thought that was a really good experience that a university would put that on otherwise you get to college and go ‘Oh this isn’t what I thought it would be’,” said Eden’s mom, Cindi, who is an alumnus of Indiana Wesleyan University. “One professor [at the camp] said kids either leave here going, ‘Oh, no, no, nursing is not for me,’ and they know that before they spend thousands or they go, ‘Yeah, I really like to pursue that,’” said Cindi Troyer. Eden hasn’t chosen a college yet, but she is impressed with Indiana Wesleyan. “Indiana Wesleyan seems like a very good option,” she said. Extracurricular activities keep her pretty busy when she’s not concentrating on her lessons. She plays flute in the marching band and sings in the choir. “I like expressing my talents,” she said. She is also in 4-H, having shown chickens and pigs. She also shows an interest in photography and babysits in her spare time. She says she really likes going to Elida Schools. “You can make a lot of friends, and the teachers are really pretty nice and they help you learn. They like to help you if you have a problem and explain it,” she added. https://www.limaohio.com/wp-content/uploads/sites/54/2018/07/web1_Youth-Profile-Troyer-toned.jpgEden Troyer, 14, of Elida Schools, hopes to become a nurse one day.